Very nice Wraithguard! I just had alot of questions answered without having to ask them. Awesome that you included the size of the sleeve and heatshrink. Easy to do since you don't have to remove the connectors. Though is it possible to remove and re-attach the connectors if you want for eg. to shorten the cable? And what about lacing or having several cables run parallel? One small thing Wraith, if you have Sata ports that stack, this might (probably will) not allow them to be installed next to each other, it's already pretty tight without sleeving me thinks. Stacking them isn't really a problem they sit side by side or on top of each other pretty well, I was kind of in a rush when I did the guide. But if you spend a little bit more time on the shrink it gets smaller, I think it something like 3/1. But everyone must pay attention to the shrink, if it starts to go a cloudy milky grey STOP! otherwise it bursts and you have to start again. My cable connectors are *already* touching when I plug them into these type (although mine don't seem to have the extra gap this example shot does) just wanted to point that out is all. I suppose you could double sleeve two together perhaps? 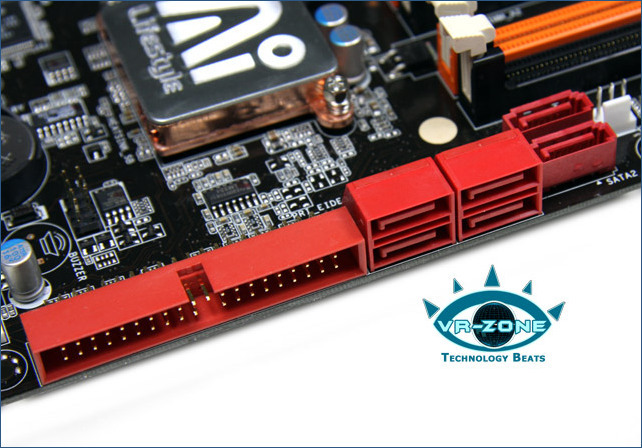 Edit: lol i googled bloody sata ports... and that image is from this site, fancy that.. wonder why it has a different watermark on it..
Or you could use a narrower shrink, stretch it to fit over the socket and simply shrink the sleeve to the cable instead of the socket. Great Job. One point that I find helpful is a tip I got from another person. I use a bit of brush on superglue right at the end of the plug to hold the sleeve in place while fiddling with the heat shrink. It makes it worry free as you don't have to hold the cable / sleeve in place while stretching the shrink over the connector. a: it can get messy. But that said if you slide the slack out of the sleeve it won't move about too much when shrinking. I spoke too soon! Thank you!! Except I don't have all the necessary tools haha... How much did all the tools run you?